Happiness is a string of daisies on a bright blue spring day! We’ve been away the past week (I know radio silence is hardly a rare thing from me anyway – apologies on that count…) staying on a farm on the outskirts of Clarens in South Africa. In the evenings while the husband went out with friends, I stayed behind with the children and once they were asleep would find my hooks and get on with bits and pieces including starting some socks by special request by hubby – one day I’ll finish them!! 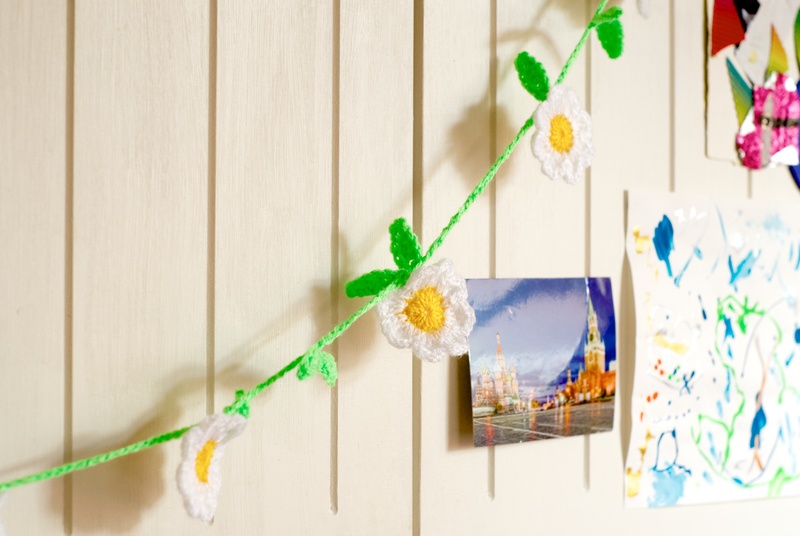 But I DID manage to finish the daisies for this pretty bunting, and now they are connected and looking so fresh and pretty! I’ve simply ironed them to get them to keep their shape, and now I need to figure out a way of packaging them so that they stay fairly flat…. well, what’s a day without some kind of challenge, hey?! 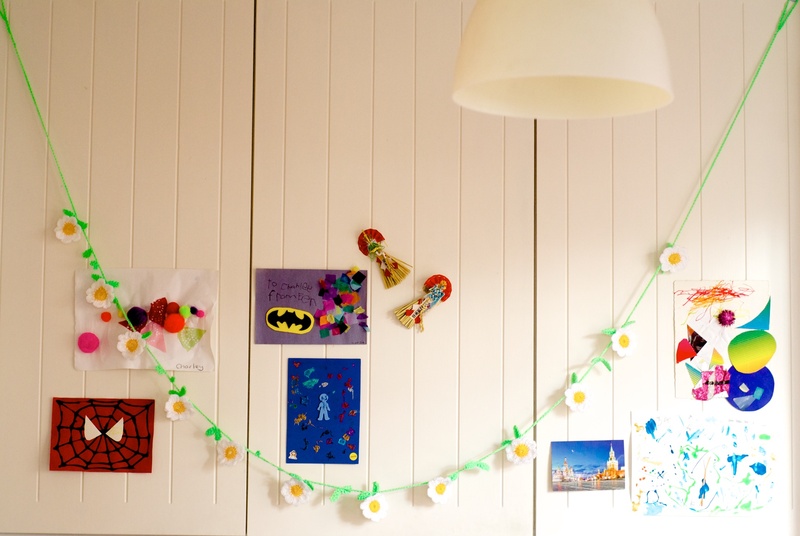 Here’s the pattern for the bunting, very very roughly. I made 12 daisies using the pattern on the chart below, using DK acrylic and a 3.5mm hook to keep them small and neat. Then, using a 4mm hook I started the chain in green. There are hanging loops at each end: ch30, then join into a loop with a slip stitch, and carry on with the chain. Work as many chains as you need for approx 35cm of chain when not stretched. Work leaves as you go: ch7, sc into 2nd ch from hook, hdc in next st, dc in next 2 st, hdc in next st, sc in next st, sl st to finish leaf, then carry on either working chain stitches or attaching a flower. 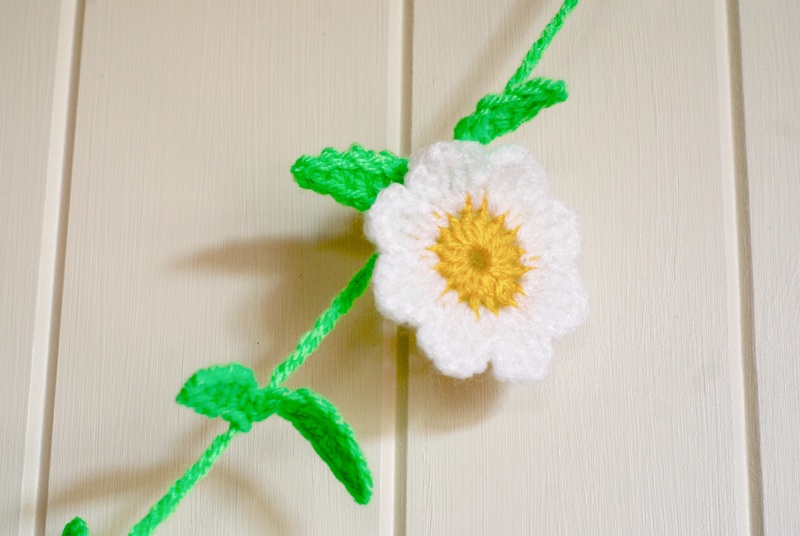 Attach flower by inserting hook through the back of a sc stitch on the back of a flower and pulling yarn through in a sl st.
Small leaves are simple picot stitches – work 4 or 5 chains, then sl st in 4th or 5th chain from hook to form a loop, then carry on working chains. Each length of chain stitches between flowers is approx 13.5cm, to give a final bunting length from the first flower to the final flower of around 1.5m. I ironed my flowers and leaves with a warm iron with the pieces under a cloth to press and neaten up. 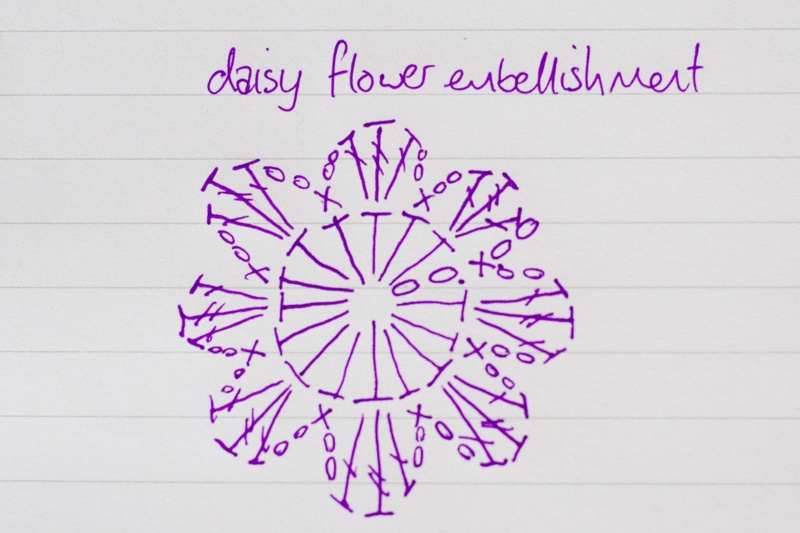 Here’s the pattern for the daisy flower. 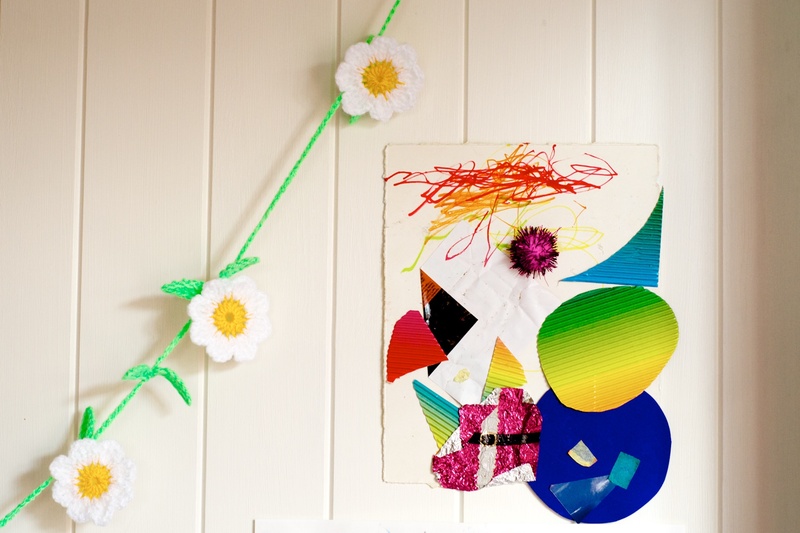 This entry was posted on March 25, 2015 by the messy mama in crochet and tagged bunting, crochet, daisy, flower, spring.